While first-time homebuyers are facing certain challenges entering the housing market, that doesn’t mean they aren’t spending on upgrades to the homes they end up owning. According to a recent report by Houzz, first-time homebuyers in 2016 dropped more than ever on renovations, spending an average $33,800. Homeowners overall spent an average $60,400. First-time homebuyers aren’t starting with small changes, either—in fact, many have taken on remodeling four rooms at once, including more involved projects like bathrooms and the kitchen. Most, as well, are focused on outfitting their new homes with smart home technology. 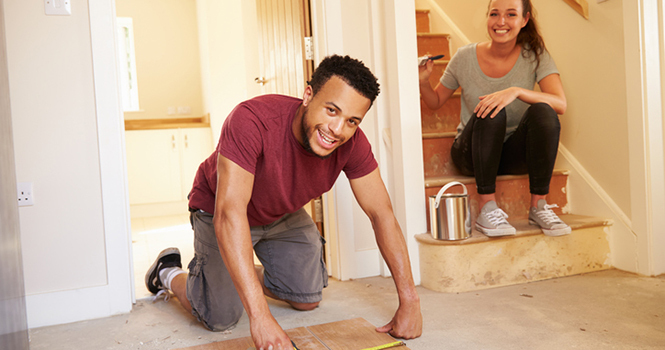 That lack of cash for a more expensive home could explain why first-time homebuyers rely more on credit cards to finance renovations than other homeowners, according to the survey. Ninety-one percent of homeowners overall fund renovations, at least partially, with cash. Eleven percent fund them by taking out a loan, mainly a home equity line of credit (HELOC). First-timers are also having trouble keeping renovations within budget, with 47 percent of those surveyed reporting it challenging to stay out of the red. They are, however, willing to ask for help, being just as likely as other homeowners to hire a professional.